EBSCO ???? ?, Hasselt-??? ?? ?????????? ??????? “Open Science Directory“-??? ?????? ??????????? ?????. ?????? ??? ???????? ?????????? ????? ????? ???????????? ???????? ??????? ?? ??? ?????. ?????? ?????????? ???? ?? ?????? ??? ???? ??????? ???? ????????? ??? ??? ???????? ????????????? ???????? ?, ????? ???????? ?????????? ????????? ?? ???. ???-??? ????????? ?????????? ?, WHO, FAO, ????? UNEP, ???????? Directory of Open Access Journals ????????????? ???? ????????? ???? ????? ???????????? ??????? ?, ???????? ???????? ???????? ?????? ?????????????? ?????????? ??????? ??? ????? ?????. ??????? ????? ??? ???? ?? ???? ????????? ?, ????? ???????????? ?????????? ?, ????? ????????????? ? ????? ????????????? ????????? ?????? ?????. ????????? ?????????? INASP, eIFL, eJDS ????? ?????. ?????? ?????????? ?? ???? ??? ???? ???? ?, ?????????????? ??? ???? ??????? ????? ?? ?????? ????? ?? ???????????? ???? ?????. ???????? ?? ????? ?????? 13000 ????? ????? ???????????? ?????? ?, ?????? ?????????????? ??????????? 20000 ????? ?????????? ?-Z ?????? ?????? ?????????? ?, ?????????? ???????????? ???????? ????????? ???? ???????? ???????? ??? ?????? ?????. ??? : ????? ?????????? ?????? ????? ?, HINARI, AGORA, INASP-PERI, OARE, eIFL and eJDS ????? ??????? ?, ?????????????? ??? ?????????? ????????? ???? ????? ??????????? ?????????? ???? ???????????? ??????? ???????? ??. http://www.opensciencedirectory.net/ – ??????? ??? ???? ??. ????? ????????????? ???? ????? EBSCOhost ???? ??? ???????? ??????? ????????? ???? ??????/???????? ?/ ??????????? ???????? ?????. 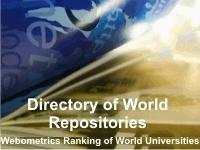 Webometrics Ranking of World Universities hat eine neue Ausgabe seines Web-basierten Rankings akademischer Institutionen in der Welt (14.876), von denen immerhin 377 in Deutschland liegen, herausgegeben. Das Web-basierte Mass soll besser als reine Zitierungs-Addition die akademischen Gesamtaktivitäten widerspiegeln. In das gewählte Maß gehen ein mit 20% der Seitenumfang des Servers; 15% nachgewiesene wiss.Dokumentenzahl auf dem eigenen Server; 15% Sichtbarkeit bei Google Scholar; 50% Sichtbarkeit (Zahl der Links, die auf die Domain verweisen). Die ersten24 Plätze belegen Universitäten aus USA. In der Weltrangliste finden sich die deutschen Institutionen ab Platz 99 (U. Leipzig, noch vor der Humboldt-Universität Berlin (112). [Oldenburg liegt auf Platz 385, TU München (381), die erste Fachhochschule auf Platz 795. Humboldt-Universitaet Publikationsserver (17). MPG eDoc-Server (153). Insgesamt zeigt sich, dass die deutschen Hochschulen sich unter Wert darstellen, weil der größte Teil der von ihren Wissenschaftlern erstellten Dokumente nicht als digitale Kopie nachgewiesen wird, weil die internationalen Kontakte nicht genuegend und bilateral auf dem Webserver der Universitaet dargestellt werden, und auch, weil es z.T. keine einheitliche Webdomain gibt. Yes, as noted, the three first ranks go to “thematic” (i.e., discipline- or or subject-based) Central Repositories (CRs): (1) Arxiv (Physics), (2) Repec (Economics) and (3) E-Lis (Library Science). That is to be expected, because such CRs are fed from institutions all over the world. But the fourth-ranked repository — and the first of the university-based Institutional Repositories (IRs), displaying only its own institutional output — is (4) U Southampton EPrints (even though Southampton’s University rank is 77th). Moreover, the fifteenth place repository — and the first of the department-based IRs — is (15) U Southampton ECS EPrints (making it 10th ranked even relative to university-wide IRs!). None of this is surprising: In 2000 Southampton created the world’s first free, OAI-compliant IR-creating software — EPrints — now used (and imitated) worldwide. But Southampton’s ECS also adopted the world’s first Green OA self-archiving mandate, now also being emulated worldwide. And that first mandate was a departmental mandate, which partly explains the remarkably high rank of Southampton’s ECS departmental IR. I am not saying all this by way of bragging! I am begging other institutions to take advantage of the fact that it’s still early days: Get a competitive head start too — by creating an IR, and, most important of all, by adopting a Green OA self-archiving mandate! By today [5.Feb.2008] the Petition for guaranteed public access to publicly-funded research results to the EU, as sponsored by SPARC, DEff, DFG, JISC, SURF, and realized by Key Perspectives of Alma Swan, has been signed by 27.047 persons and institutions. A statistics of how many from which country, professional field, institution type you find at Statistics of the first 18.000 Signatees. Recently, the executive Director of JISC, David Prosser gave a podcast interview (4th Feb. 2008), on the background and his opinion that Open Access made it at last.